Shop for recommended product for Meyer's or Senegal Parrots. Keep your Meyer's or Senegal Parrot Healthy, Happy & Entertained with our range of food & treats, toys, cages, accessories & supplements. Shop for everything you need right here. Fast Shipping! Free Delivery on Orders Over £39! 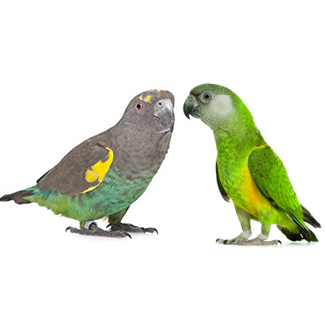 At Parrot Essentials, you can’t beat our selection of food and treats, toys, accessories, cages and supplements available for your Meyers or Senegal Parrot. Let’s start with diet. Your parrot needs a highly nutritious and varied diet. When your browse our foods, you will find mixed berries and nuts, complete foods, pelleted diets, and more. Every pack of bird food boasts not only high nutritional value but also the most delicious flavours that every Meyer and Senegal would truly love to feast on daily! Don’t be afraid to spoil your bird with treats. Our savoury lines of healthy treats are just what your Meyers and Senegal need to promote a healthy eating diet. Use them for training or simply a healthy snack. Our treats are packed with lots of flavours and nutrients! Speaking of nutrients, when your Meyers or Senegal Parrot gets fussy about their food, using our supplements can help give them an extra boost of vitamins and minerals! Some can be added to foods, while we have others that can be added to drinking water. Meyers and Senegal parrots are very inquisitive and need plenty of stimulation. We have just what you need. Keeping your bird entertained has never been easier than with our selection of climbing and swinging toys, foraging toys, and more. In addition to toys, we have Parrot perches and accessories to choose from. For example, our Wooden Fun Twirler Spinning Parrot & Bird Perch is the perfect 2-in-1 toy/perch! This toy is designed around a natural wooden perch, which exercises your bird's feet and the multi-coloured spinner at the end promotes a full body workout and mental stimulation! It is important to ensure that your Meyers and Senegal Parrot cage is big enough for all these toys and accessories. Here at Parrot Essentials, our bird cages are specially made to meet your beloved bird’s unique needs. Each bird cage is made from durable and lightweight materials. From lockable doors to pullout trays, bird lovers are sure to find the best cage for any purpose! Allowing your bird to spend time outside of their cage is easy with a Parrot stand. Stands provide a safe place, outside of their cage, for your Meyers or Senegal to play!